CHENGDU, China- Even in China, where power plants, coal mines, water-transport networks, and other big tools of industrialization are built at astonishing scale and with surprising speed, the hydropower dam construction program in Sichuan, Yunnan, Tibet, and other southwest provinces has no equal in China, or anywhere else for that matter. Israeli journalist Rachel Beitarie reports on China’s mammoth dam-building program for Circle of Blue, the sixth chapter in the Choke Point: China series that I’m editing and helping to report and write. Next week, we leave for China to publicly disclose the findings in the series in a series of events that start on April 1 with a conference appearance at the U.S. Embassy in Beijing. Big takeaway for me is that while the United States is pursuing an energy policy designed to perpetuate the fossil fuel era, China is aggressively mastering every form of energy available. Not veto in the system is why. Here in Suijiang County-a remote and mountainous region on the border between Sichuan and Yunnan provinces-the immense scope of the most aggressive dam-building program in history is immediately apparent. Near the county’s center, an army of men and equipment is building the Xiangjiaba Dam, a wall of concrete and steel that is 909 meters (2,982 feet) long and 161 meters (528 feet) high. When completed in 2015, the dam will house eight turbines capable of generating just over 6.4 gigawatts. It will be the fourth-largest hydropower plant in China and one of the 20 largest power plants of any kind in the world, according to industry figures. The Chinese government’s vigor for hydropower has stirred resistance in villages upriver from the Xianjiaba project, where farmers are about to lose their homes. Filling the reservoir will require 60,000 people to leave. Among them are the residents of Guan Tian village, who were forced to relocate six months ago, well ahead of the scheduled relocation; and in a hurry. Residents were told that the construction was going to cause a landslide that would bury their village. “Luckily there were no casualties. We all got out in time,” an elderly woman-who, like all of her neighbors, has asked that her name not be mentioned-told Circle of Blue. The entire population of Guan Tian now lives in shacks on rented land. Residents were given temporary compensation of $US 45 a month, though a number of residents complain that, in the last two months, the money has failed to arrive. The protests, however, went unheeded by the provincial government officials, as well as those in distant Chongqing-the fastest growing city in the world-which is starving for energy to feed booming industry and a growing middle class. Immense as it is, the Xiangjiaba Dam is just one of a dozen hydropower projects of similar scale in what Chinese engineers call a “cascade” of electricity-generating projects that have been approved for the Jinsha River-a 2,300-kilometer section of the Yangtze River in Sichuan Province. An even larger project, the 278-meter-tall (911-foot) Xiluodo Dam, is nearing completion downstream and will have the capacity to generate 12.6 GW of electricity. Taken together, the 12 Jinsha River dams will be capable of generating 59 GW, or nearly as much power as all 4,000 hydroelectric generating stations in the United States. China already operates half of the world’s large hydropower dams, and there are more on the way-many more. 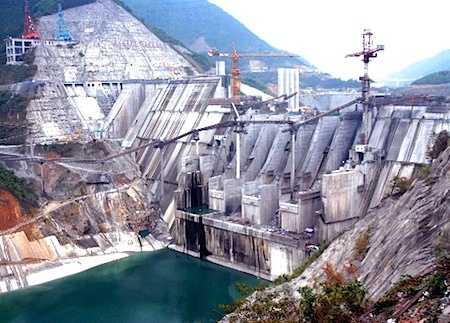 Along China’s midsection, the upper Yangtze River and five of its tributaries have 100 big dams that are in various stages of planning, engineering, and construction. Additionally, at least 43 big dams are in the same stages of development on the Lancang, Nujiang, Hongshui, and Jiulong rivers in China’s southwest. The stakes for China’s dam-building campaign encompass every sector of the economy, as well as a historical and ecological heritage that spans seven southern provinces. The provincial and central government leaders who support China’s program to tame wild rivers with concrete, steel, and stone assert that hydropower provides considerable benefits to reduce air pollution, rein in coal consumption, and generate electricity for fast-growing cities and industries. But opponents say the dams are wrecking treasured canyons, ruining fisheries, and displacing hundreds of thousands of residents. Some critics worry that most of China’s new big dams are being built in a seismically active region that has experienced a number of big earthquakes, including one in May 2008 that killed 80,000 people in Sichuan Province. A number of scientists theorized that the weight of the lake held back by the 760-MW Zipingpu Dam-built less than two kilometers from a major fault line-may have helped to trigger the disaster. Just as significantly, opponents note that China is planning to generate a considerable portion of its energy from hydropower, relying on rivers that are becoming more susceptible to droughts. Because of climate change, say scientists, China’s southern region is experiencing longer and more numerous droughts that are lowering water levels. See more at Circle of Blue.